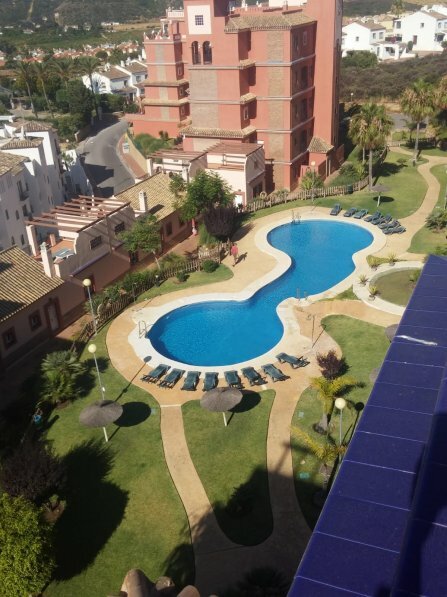 This lovely 3 Bedroom Apartment is situated in a private and beautiful complex that is within a short walking distance from the port and seafront, very near to Duquesa Golf and Country Club. Duquesa Regent has security gates, private undercover parking and the beautiful gardens are complete with a well-maintained pool, Paddle Tennis Court and also a communal terrace. The Apartment has three bedrooms, two with double beds and one twin room making it perfect for a party of 6, you also have two en-suite bathrooms and one family bathroom meaning there will be no fighting over who gets to use the bathroom when getting ready. You also have a fully equipped kitchen complete with Cooker, Fridge freezer, microwave, dishwasher, kettle and toaster making it the perfect place to create homemade dinners to eat on the Balcony. The Lounge has a lovely L shaped sofa with enough seating for the entire of your party and has a flat screen TV with UK channels .and a DVD player for the nights you want to spend in. You also have a dining table with seats for up to 8 guests if needed. You have an outdoor communal pool with shared sun beds which is perfect for the whole family to enjoy which is surrounded by the maintained gardens. This Apartment has Linens and shower towels included.